Small net, waders (preferably chest) and a lightweight, waterproof jacket. Various fly casts, including roll, side and the bow and arrow. They say size isn’t everything, and it’s certainly true when it comes to this very rewarding form of fly-fishing. Over the years, I’ve become addicted to the charms of catching pretty wild brownies, admiring their butter coloured bellies and bright red spots. Most fish weigh-in under the half pound mark, but on occasions you’ll winkle out a much larger specimen from a deep hole. Sport tends to be off the surface, which proves very exciting and it certainly keeps your responses in check. In my opinion, this is a very underrated style of fly-fishing; which is highly addictive. We’ll travel light to cover as much water as possible; waving a wand-like 7-8ft rod among overgrown trees and backside vegetation. 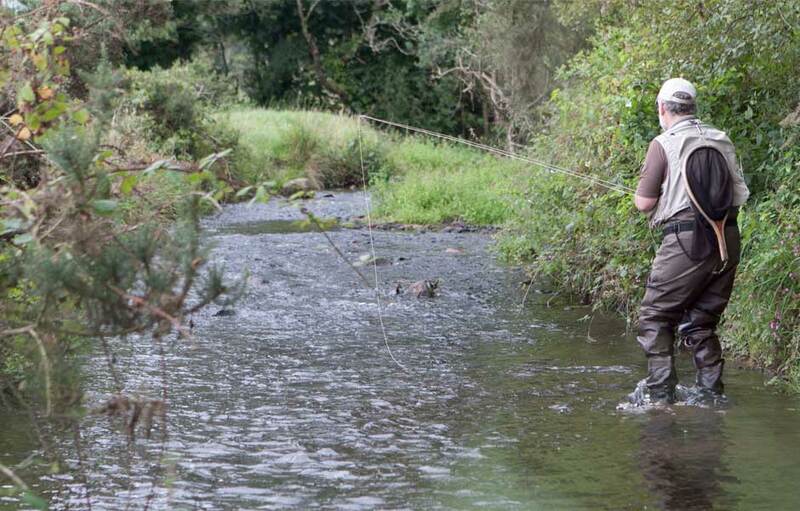 Around every corner there’s a new challenge and an opportunity to try and accurately flick a fly to ever willing wild fish – they certainly keep you busy! This will test the skills of the most experienced angler, and I’ll guarantee that you’ll want more. There’s something special about outwitting a truly wild creature among such beautiful surroundings. With some steep, slippery banks and difficult access points, you’ll need a reasonable level of fitness to enjoy the session. Seasons: 3rd March to 30th September. Rivers: Lliw, Llan, Gwilli and Morlais (all near Swansea).